It was a fun surprise for me to spot a pair of my Spring product designs in the current March issue of Country Sampler Magazine! 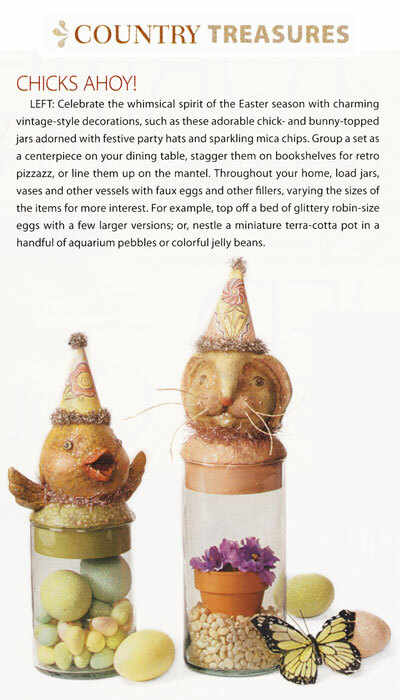 Under the "Chicks Ahoy" heading on page 11, the magazine recommends grouping them as a set for your dining table's center piece, staggering them on bookshelves for retro pizazz or lining them up on the mantel! Whatever you do, make sure to fill them with treats, or in this case, Easter eggs and flowers will do. Be creative. And thanks goes out to The Holiday Barn for sourcing my vintage-style spring jars on their website! 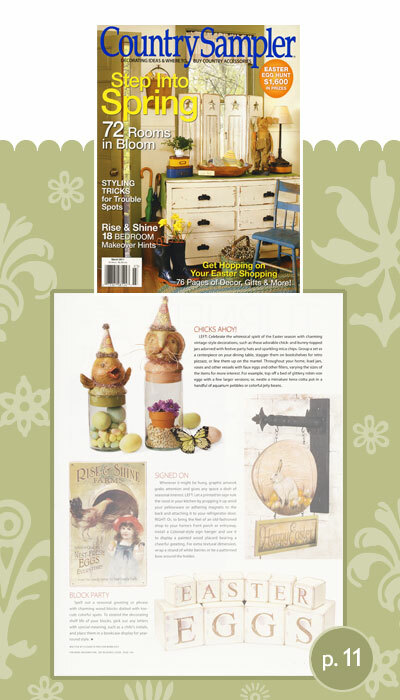 * Look for your copy of Country Sampler today and don't forget to visit all the various Country Treasures featured for March!